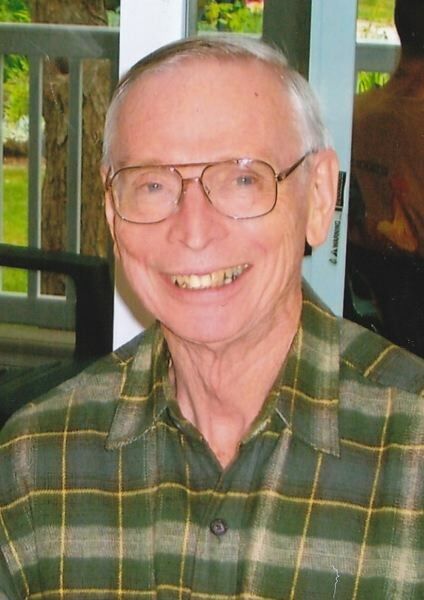 William (Bill) Arthur Monroe of Sheridan passed away peacefully with family at his side on Dec. 18, 2013. Bill was born to O.P. and Grace Monroe at home in Mulino, Ore., on June 29, 1931. He married his Molalla High sweetheart, Beverly (Chindgren), on June 24, 1951. Bill was a devoted husband, father, teacher, coach, lay minister, builder, singer, entrepreneur and “servant of all.” He will be remembered for his genuine love and concern for others, inspired by his deep faith in Jesus Christ. Even in his last days, ravaged by Alzheimer’s and failing health, he expressed his love and blessing to his family. Bill was blessed with a beautiful bass voice. He sang in various groups and provided solos for many events. He farmed and ran a farm equipment business in Mulino before earning his B.A. in education at age 32. In the 1960s, he coached wrestling and taught in Colton, served as director for Camp Colton, and was on the board for Lutheran Outdoor Ministries and the Colton Lutheran Pioneer Home. In 1970, he moved his family to the hilltop outside Sheridan. He served as teacher and principal for Hopewell before teaching special education and elementary school in Sheridan until he retired in 1990. Bill coached Sheridan High’s wrestling team in the early 1970s. He enjoyed leading singing and activities for Sheridan’s Outdoor School program. Bill started the family sawmill, Monroe Oak, in 1978. He was creative and skilled in many ways, helping design and build several homes. Community involvement was important to him. He served as a director of the Sheridan Fire District from 1987 to1995, and also volunteered with Rotary, Habitat for Humanity and others. He was named “Sheridan First Citizen” by the West Valley Chamber of Commerce in 1994. He was a devoted member and lay minister at Trinity Lutheran Church in Sheridan, visiting shut-ins, singing in choir, teaching classes, serving as substitute pastor and congregation president. Through his vision and leadership, enough anonymous donations were garnered to build Trinity’s current church (renowned architect Pietro Beluschi’s last structure) without a mortgage. Bill is survived by his loving wife of 62 years, Beverly; daughters, Elin (Hal) Hagglund of Sheridan and Lora (Bill) Howden of Salem; sons, Dan (Jane) of Sheridan, Doug (Geri) of Mulino, Cliff (Laura) and Andrew (Kristen) of Sheridan; brother, Charles (Yoko) of Alameda, Calif.; 20 grandchildren; 16 great-grandchildren; and many nieces and nephews. He was preceded in death by his sisters, Elizabeth Drews and Jean Farrell; and brothers, Guy and Cal.